r -- A vector given by x and y. All the purpose of the methods of the electron image series reconstructions with TEM is to find an object wave function, ψo,s. The reconstruction methods can be basically categorized by two groups: i) weak phase object approximation (WPOA) and more generally ii) phase object approximation (POA). In principle, the methods based on the POA give a better estimation of the object wave function, but they don’t have closed form solutions and have to be computed iteratively and thus is very time consuming. On the other hand, the reconstruction methods based on WPOA are fast but the TEM imaging requires much thinner samples. Based on multislice simulation on SrTiO3 crystal structure (Figure 4217 (a)), Forbes et al. obtained the exit surface intensities with the total electron intensity, the elastically scattered electron intensity and the thermally scattered electron intensity. The simulation was carried out on a TEM specimen in thickness of 30 nm with a 300 keV electron probe. D.Van Dyck, H. Lichte, K. D. van der Mast, Sub-angstrom structure characterisation: the Brite–Euram route towards one angstrom, Ultramicroscopy 64 (1996) 1–15. P. Geuens, D. VanDyck, The S-state model: a work horse for HRTEM, Ultramicroscopy 93 (2002) 179–198. S. Van Aert, P. Geuens, D. Van Dyck, C. Kisielowski, J. R. Jinschek, Ultramicroscopy 107 (2007) 551–558. 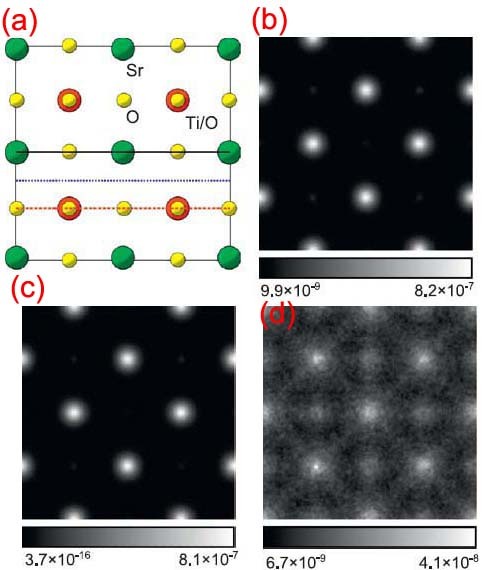 P. Buseck, J. Cowley, and L. Eyring, High Resolution Transmission Electron Microscopy: And Associated Techniques. Oxford University Press US, 1992. A. I. Kirkland and R. R. Meyer, Indirect high resolution transmission electron microscopy: Aberration measurement and wavefunction reconstruction, Microscopy and Microanalysis, vol. 10, pp. 401–413, 2004. B.D. Forbes, A.J. D’Alfonso, S.D. Findlay, D. Van Dyck, J.M. LeBeau, S. Stemmer, L.J. Allen, Thermal diffuse scattering in transmission electron microscopy, Ultramicroscopy 111 (2011) 1670–1680.